This is the official project blog of the AHRC-funded research project Out of the Wings: Spanish and Spanish American Theatres in Translation. The blog will be regularly updated by the Project Team and we hope it will offer an interesting perspective on our research. Out of the Wings at King’s College London is thrilled to present ‘OOTW2016’, our first muestra/mostra of play readings from some of Spain and Latin America’s finest writers, all presented in brand-new English translations. Five writers from Brazil, Argentina, Spain, Uruguay and Peru take us on a journey from London to Lima (via Madrid, São Paulo, Montevideo and Buenos Aires), crossing the borders of geography, language and genre in a showcase of Ibero-American writing in all its breadth. In The Blindman and the Madman, Brazil’s Cláudia Barral explores taboo subjects such as old-age romance, depression, disability and the fine line between what is real and what we want to see, as weakling Nestor waits at home with his haranguing older brother for a visit from their neighbour upstairs. Will she ever arrive? From Argentina, Griselda Gambaro’s As the Dream Dictates follows one woman in her dreams and desires, although the characters she invents rebel against her simple and wishful designs. She longs to be free, to be loved and cared for unconditionally, yet her dream is governed by rules of its own. Dictatorship looms heavily in the memory of The Sickness of Stone, by Blanca Doménech. Here, one of Spain’s largest and most controversial national monuments – Franco’s Valley of the Fallen – is the setting for a disturbing contemplation of shared trauma, history, and the impossibility of practicing what we preach. Uruguay’s Raquel Diana takes real-life events in London’s Wood Green as the inspiration for Dancing Alone Every Night. Dark and funny by turns, a woman sits in the limbo of her living room, wondering if the connections she so desperately yearns for will ever come her way, or if the Christmas presents she has bought will ever be wrapped – or opened. Translators Almiro Andrade, Gwendolen MacKeith, William Gregory, Sophie Stevens and Mary Ann Vargas bring these works to English for the first time. They will be joined by directors Sue Dunderdale, Camila França and Camila González. On Friday, July 8, in ‘Worldmaking on Stage’, Out of the Wings dedicates a whole day to workshops, seminars and discussions on the practice of theatre in translation. This in an opportunity to participate in a workshop on directing the translated play, and will be led by Catherine Boyle and Sue Dunderdale, with a team of theatre practitioners, translators and scholars. Out of the Wings – Spanish and Spanish American Theatre in Translation: A Virtual Environment for Research and Practice – began in 2008 as a three-year collaboration between King’s College London, Queen’s University Belfast and the University of Oxford. The project aimed to make the riches of the theatres of Spain and Spanish America accessible to English-speaking researchers and theatre professionals. Funded by the Arts and Humanities Research Council, the project’s many outcomes included an unrivalled database of theatre texts from Spain and Latin America, a series of seminars, lectures, publications, involvement in many theatre readings and productions, and an ongoing legacy of work and research into the field. Today, Out of the Wings at King’s is a collective of theatre-makers, researchers, translators and academics with a shared love of theatre and the possibilities of cross-border collaboration and exchange that are released when works for the stage are translated for new audiences. Our most recent work at King’s College London now also encompasses the Portuguese-speaking world. Or by staying to say ‘hola’ to us after the readings. This Symposium is an opportunity to hear from and debate with scholars and practitioners of Latin American theatre. Panel speakers will discuss issues relating to theatre translation, adaptation and practice, with papers on both classical and contemporary theatre in translation and performance throughout Latin America. This is a free event, but please register your place on the Canning House website HERE. 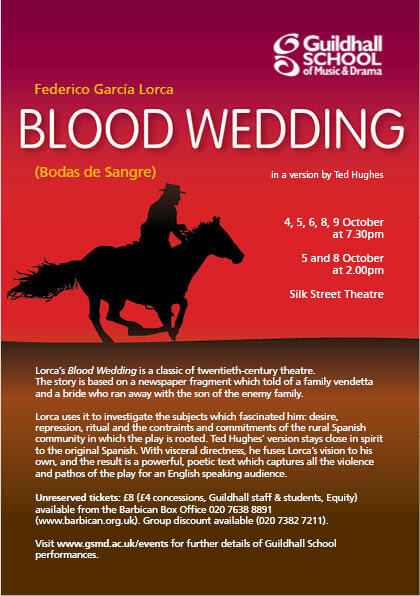 The Guildhall School of Music and Drama presents Blood Wedding / Bodas de Sangre by Federico García Lorca in a version by Ted Hughes directed by Christian Burgess. Performances will take place at the Silk Street Theatre, Barbican between 4-9 October 2012 nightly at 7.30pm. Matinee performances on 5 and 8 October at 2pm. Unreserved tickets cost £8 or £4 concession for Guildhall staff, students and Equity members. Further information and online booking available on the Guildhall School of Music and Drama website. The first Amigo Month/Mes Amigo will be held in London this autumn. Come celebrate Latino Hispanic and Lusophone Heritage! Enjoy a wide variety of events to celebrate the cultures and languages of Spain, Portugal and Latin America. The month will kick off with a Fiesta Latina for all the family on 2 September, 11am – 6pm, outdoors at the Bernie Grant Arts Centre, London, N15 4RX. Events include music concerts, debates, films, and the CASA Latin American Theatre festival – which takes place between 7 – 16 September. For more information about events during Amigo Month/Mes Amigo, go to www.mesamigo.com. A perfume advertising campaign goes wrong. A cynical reporter and a young photographer interview the attractive young model now at the centre of a scandal. The lift to her apartment breaks down, the paper wants its story and journalists are out of contact. Orange Tree Theatre presents Yours for the Asking (Usted también podrá disfrutar de ella) by Ana Diosdado in a translation by Patricia W. O’Connor and directed by Sam Walters. Performances run from Wednesday 5 September to Saturday 6 October. Post-show discussions will take place after every Thursday Matinee performance in September. Tickets and pricing information available online via the Orange Tree Theatre website. As part of the CASA Latin American Theatre Festival there will be a reading on 27 June 2012 of Professor Catherine Boyle’s translation of Juan Radrigán’s Hechos consumados, in English entitled When All is Said and Done at the Bolivar Hall London. The performance will be directed by Sue Dunderdale and followed by a discussion led by Catherine Boyle. Doors open 7pm. Tickets are free and can be preordered from http://www.brownpapertickets.com/event/255460. More information is available from the CASA Festival website. Kamikaze received the Hermanos Machado (Seville 1994) award. Noise examines the effects of violence on a middle class family in Lima in the late 1980s: a time when terrorist activities have hit the capital, chronic inflation is unsustainable and food is scarce, a sardonic revision of the absurdity of domestic life in times of war. Kamikaze and Noise are part of a trilogy of Peruvian contemporary plays translated by Mary Ann Vargas, ready for publication under the provisional title of Stages of War. Uncover new riches from theater history’s best-kept secret – the Spanish Comedia nueva. Overhear vibrantly expressed underdog perspectives, as Native Americans and women take center stage. Unearth golden opportunities for critical study, performance experimentation, and dynamic teaching. 1. Ana Caro’s Valor, agravio y mujer (c. 1640). Known Fact: playwright Ana Caro (c. 1600–1652) illuminates undercover history of female playwrights during the Siglo de Oro. Known Fact: protagonist Leonor (a/k/a Leonardo) mounts feminist counter-attack on Don Juan. Facts To Be Determined: How do Caro and her heroine open new horizons for Comedia research, shedding light on theater-making during the Spanish Golden Age and raising implications for staging and teaching today? How does translation by Amy Williamsen (Courage, Betrayal, and a Woman Scorned) and editing by Ian Borden equip this play for resurgence in America? 2. Lope de Vega’s El nuevo mundo descubierto por Cristobal Colón (c. 1600). Known Fact: first play in history to put Native Americans on stage. Known Fact: explores the causes and consequences of first contact between Europe and America. Facts To Be Determined: How do Nuevo mundo’s Amerindian characters interrogate theater’s capacity to challenge expectations about aliens, explode stereotypes, and promote human rights? How can translation for Florida’s quincentennial (1513-2013) make this play a springboard for everyday citizens to engage in cultural rediscovery? Post initial responses to target plays on session’s wiki (June). Contribute to online library of resources for researching target plays (July). Formulate collaborative list of team research questions (August). Produce an individual paper that explores a target play through a specific research question (September). Respond to other team members’ papers and develop presentations for ASTR’s conference (October). Participate in presentations that report team findings, stimulate discussion, and actively involve all ASTR members attending the session’s meeting in Nashville (November). Team Leaders Karen Berman (Georgia College & State University), Nena Couch (Ohio State University), Janine Kehlenbach (11 Minutes Theatre Company, Denver), and Darci Strother (California State University San Marcos). Senior Scholars Ian Borden (University of Nebraska Lincoln), Ben Gunter (Theater with a Mission, Tallahassee), Grover Wilkins 3rd (Orchestra of New Spain, Dallas), and Amy Williamsen (University of North Carolina Greenboro). Respondent Susan Paun de García (Denison University). Because operations to incorporate comedias into teaching, production, and research in America can fail when agents encounter difficulty in decoding texts, teams will focus on equipping target plays with features that make them user-friendly – e.g., guides to critical hotspots, maps for classroom activities, and pointers for putting the scenes into production. These resources will remain available longterm via wikispace postings. Because this session targets comedias newly translated for performance in the US, team presentations will include rehearsed readings of critical scenes, putting research findings into practice and enhancing the session with performance elements. Readings may be re-presented afterhours to ASTR at large. 1) Craft 250-word statement spelling out your personal interest in going undercover with one of these comedias. Zero in on any aspect of the project that appeals to you. No prior experience required; diversity desired. 2) Add 150-word biographical sketch. Go public about your modern language skills, experience with theater production and/or pedagogy, allied research interests, and/or raw enthusiasm. 3) Send statement & sketch to ASTRundercover2012@yahoo.com by 31 May 2012. PLEASE NOTE: This is not a call to write a paper and read it at a conference, but a quest to burrow into research targets through months-long scholarly exchanges, to share findings with fellow agents (in writing) before ASTR meets, and to engage in intelligence-altering discussion of discoveries at the conference. More details on how ASTR working sessions operate is available at www.astr.org. (where you can also find dossiers on other working sessions you’ll be privileged to eavesdrop on by joining us undercover). Emerging insider info @ spanish-golden-age-plays.wikispaces.com. On Wednesday 23 May CASA Latin American Theatre Festival launches its 2012 programme of events at Bolivar Hall, London. There will be music, poetry and a rehearsed reading of House of Desires by Sor Juana Inés de la Cruz directed by Simon Evans and translated by Catherine Boyle. A post-show discussion of her work will be lead by Professor Catherine Boyle. Tickets are free on the door or can be pre-ordered from Brown Paper Tickets. Complementary glass of Cusqueña or glass of wine when you pre-order. More information on the Casa Festival is available online at www.casafestival.org.uk or on the CASA Latin American Theatre Facebook page. The Accidental Festival at the Roundhouse presents FourPlay – an afternoon of four short plays, including a version of It’s Raining Cows (Llueven vacas) by Carlos Be, translated by Susanna Herbert and directed by Kate Budgen. What happens when you love someone so much you believe everything they tell you? Can they make you believe that you cannot hear? Cannot see? That cows are raining from the sky? As Margaret begins to lose faith in her husband, It’s Raining Cows pushes fantasy from the sublime to the macabre, offering a surreal and moving portrait of poisoned dreams. More information on the FourPlay event is available on the Accidental Festival website.